Last week, I posted a question in my Brilliant Speaker's Club Facebook group. The question was: would you rather speak on stage in front of 100 people or speak on live TV at a studio? The response, overwhelmingly, was on stage in front of 100 people. Well today, we are going to talk about my personal experience speaking on live TV in the studio, when I was invited for a small morning segment to Fox 26 Morning News. As some of you may know, I own Nutty Scientists of Houston which is all about inspiring kids to fall in love with science. So here, locally, I'm known as Professor Proton, and our company does all kinds of things. We do enrichment programs all over Houston, we also have a brick and mortar location where we do birthday parties and camps. About a year and a half ago, I was invited to speak at Fox 26 morning news. It was right around Valentine's Day and so myself and an owner of another location of Nutty Scientist were asked to present some fun science experiments on live TV. I don't know about you but I have never been on live TV before. I've never even been inside a studio. I barely ever watch TV so I haven't even seen a single segment from Fox 26 morning news. I really did not prepare at all in terms of what to expect and I just prepared the science part. I was absolutely prepared with what I had to do and what I had to say. So I arrived at the studio way ahead of time and walked into the main studio area and “overwhelmed” kicked in. I was literally shaken. It's beautiful big studio with gazillions of lights and cameras and all those people who clearly knew what they were doing and here I am, a total newbie on TV, trying to not fall into pieces. I'm sure you can all relate to that experience. And so in my head, I just keep on going through what I need to say and I know exactly what I'm going to do. I’m trying to pump myself up. I know what I'm doing, I know how to speak publicly, I just don't know how to speak on live TV. I probably had my mouth open, deer in the headlight, had nothing on me at that moment. Because I prepared for five minutes. I knew exactly what to do and then he just tells me right here that you only have a minute and a half. And I'm already live, the camera is already on me. I have to think really quickly through what I'm going to say and what am I going to do, and I don't have any time because I am the first one to speak in our segment. The anchor’s already on me, turning to me and saying, “Hey, this is Victoria...” I had literally 10 seconds to collect my thoughts and figure out what to do. And you know what, I think in critical situations, our brain actually kicks in. And so I was able to figure out, okay, let me just do the first experiment and I’m just going to do it really, really quickly and I've gone through it. And I think I've done a pretty good job, all things considered, but that moment when something unexpected happens, something that I could not have predicted. I guess if I had done my research I could have predicted it because I'm sure somewhere on Google it does say by the way, even if they tell you your segment is X number of minutes, it could be shorter depending on today's schedule. But I had no clue. I was not prepared. And so my biggest take away from this and the biggest advice that I can give you is be prepared but have a contingency plan in place. If you know what your segment is going to be about, you know how long it’s going to last, you will prepare for your segment as is. You will prepare for that number of minutes. But try to think of what if scenarios. And not just think. I would create an excel file going forward, and I would write out my contingency plans. For example, what if my segment was cut in half? What if my segment was only quarter of the time that it was supposed to be, kind of how our segment was? What if something doesn't work? In my case, I was doing science experiments that could have been, you know, something that just didn't work correctly if I had messed up. You always want to have your what if scenarios written out. You always want to have your contingency plans in place because that's going to give you the confidence to go in front of that scary camera on live TV and at least know that you've done the best you can to prepare. Another thing that I did not do, as I mentioned, I had not watched a single morning news episode of Fox 26 News. I had no idea who the anchors were, I've never seen them in my life. Big mistake. I should have, I really should have, because that would have given me a little more of a feeling of like I know them and maybe feel a lot more comfortable being there with them. But on the flip side, I wasn't starstruck either. You know, some people may be starstruck. Oh my gosh, this is the anchor that I've been watching on TV every single morning and now I'm right in front of them, right? There's a pressure of that. Well, I didn't have that pressure. I had no idea who they were, I just knew they were anchors. And the last tip is have fun. I know it's incredibly hard to have fun in high stress situations like this. I definitely, definitely wasn't prepared to be this terrified. I had no idea I would be this scared. But even in this high stress situation, you still want to have fun with this because this is sort of a very unique experience. It's not something that we get to do often, right? To go on live TV and be in front of, I don't know, tens of thousands, millions of people, whatever the audience is for that TV station. Try to have fun with it. Because if you have this mindset that, you know what, I'm just going to have fun with this, I'm just going to enjoy this, it does translate to your viewers as you being confident, self-assured, and relaxed. It really does. So try to think of it as, you know what, whatever happens happens. I'm just going to enjoy it, I'm going to be myself and I'm going to have fun with this. Please let me know in the comments if you had a chance to be on live TV and what your experience was, and if you have any tips that you can share with us, please do so. If you like this video, please hit the like and share buttons to share with your friends and also make sure to subscribe to my channel. I post new videos every Wednesday. Don't forget to download my Brilliant Speakers Formula mini-guide form BrilliantSpeakersFormula.com and I cannot wait to see you in the next video. Grab your FREE Brilliant Speakers Formula™ Training right here! You're just moments away from taking the first step towards becoming a confident, compelling, and captivating speaker! 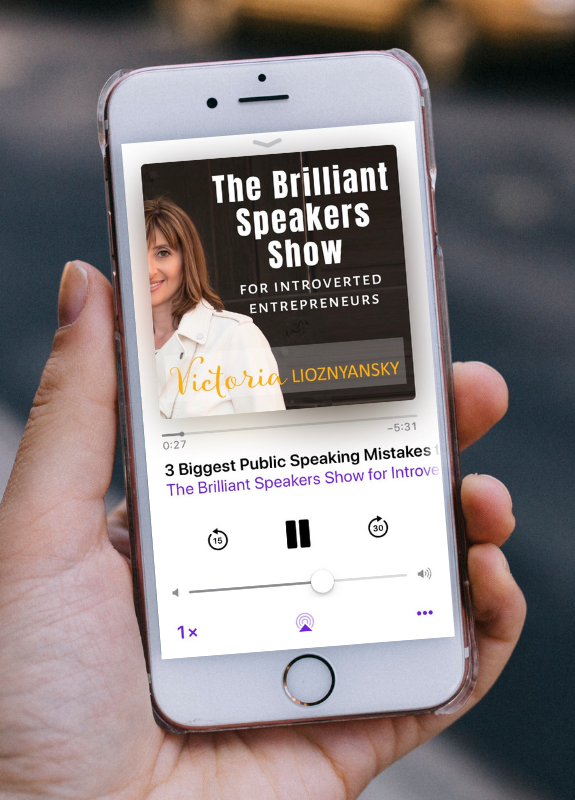 The Brilliant Speakers Show for Introverted Entrepreneurs is all about helping you overcome the fear of public speaking and transform into the confident, compelling, and captivating speaker you were meant to be. Every week I bring you my video show in a podcast format, so that no matter where you are, you can be inspired to fall in love with the spotlight… even if you’re an introverted entrepreneur like me. Grab your FREE Brilliant Speakers Formula™ mini-guide right here!